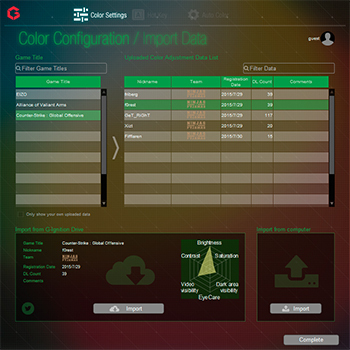 Hakusan, Japan, October 28, 2015 – EIZO Corporation (TSE: 6737) today announced that its free cloud service, G-Ignition Drive, is now available. Until now, gamers could adjust their monitors and save their gaming presets (monitor settings) only to their PCs, making it difficult to share their presets with other gamers. With this new cloud service, gamers using FORIS FS2434 and FG2421 monitors can easily upload gaming presets to G-Ignition Drive and share them over social networks. 0G-Ignition Drive stores gaming presets by game title. FORIS users simply choose the games they play and upload their own gaming presents as well as import gaming presets uploaded by other gamers. In addition, gaming presets from EIZO-sponsored professional gaming team Ninjas in Pyjamas are available on G-Ignition Drive. G-Ignition Drive is accessible by downloading G-Ignition Ver 2.0 software from gaming.eizo.com/g-ignition.